Different killer whale ecotypes, communities and pods exhibit unique characteristics in their call repertoires, which include pulsed calls, whistles, and echolocation clicks. Currently, biologists who are familiar with the calls produced by each group can acoustically classify killer whales; however, this is time consuming and requires a high level of training and experience. 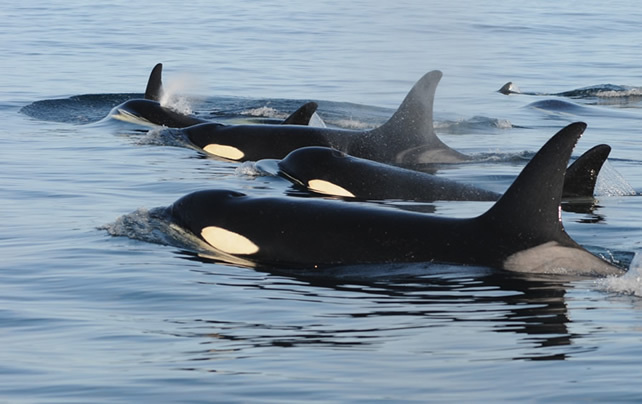 In this project, Cetos Research Organization teamed with Bio-Waves, Inc. to develop user-friendly random forest classifiers for sounds produced killer whale communities found in the northeastern Pacific Ocean. Visually validated recordings made of four killer whale ecotypes and communities (northern and southern residents, offshores, and west coast transients) along the west coast of the United States. These recordings were collected during the Pacific Orca Distribution Surveys (PODS) conducted by National Oceanic and Atmospheric Administration (NOAA) Fisheries Northwest Fisheries Science Center (NWFSC). Variables describing duration, frequency content and shape were measured from pulsed calls, whistles and echolocation clicks in each recording, and these measurements were used to train a random forest classifier. The classifier combined information from all three vocalization types to classify encounters to ecotype or community. Overall, 80% of encounters were correctly classified using this method. These new classifiers will allow researchers to more effectively and efficiently identify call types to the ecotype or community level, and to use those data to better characterize the occurrence, range and distribution of killer whales in the northeastern Pacific Ocean. The spectrograms below show killer whale calls (including whistles, echolocation clicks and a pulsed call) as a visual representation of the frequencies of sounds recorded over time. 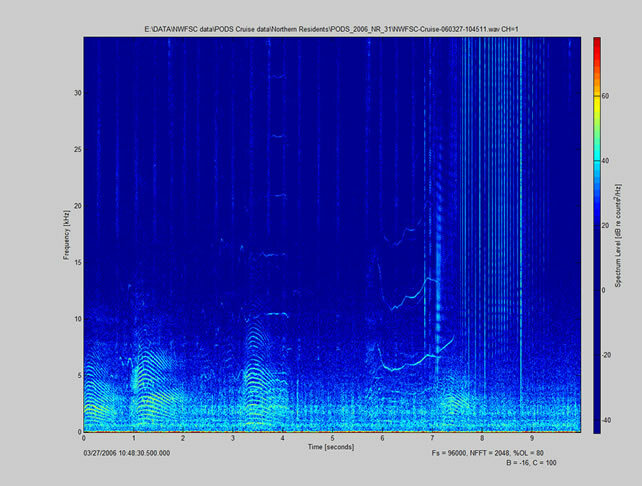 The first spectrogram is the calls alone. The other is the same types of vocalizations with different colored boxes delineating the different calls. (Echolocation clicks are boxed in green; the whistle in yellow; and pulsed calls in red). 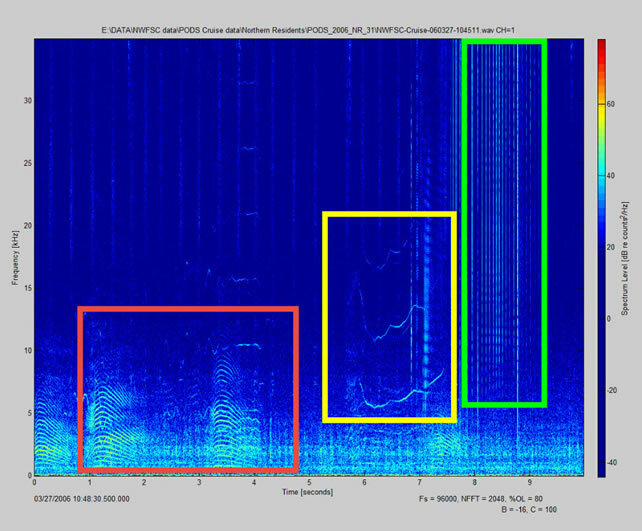 The spectrograph below is the same types of vocalizations with different colored boxes delineating the different calls. (Echolocation clicks are boxed in green; the whistle in yellow; and pulsed calls in red). ** All funding for this project was provided to Cetos Research Organization by the SeaWorld & Busch Gardens Conservation Fund Grant. Cetos is the Fiscal sponsor for this project in a joint effort with Bio-Waves, Inc. Bio-Waves designed the classifier and accomplished the work. For a detailed report on the classifier work completed with the support of SeaWorld & Busch Gardens Conservation Fund, download the full report.